How would your business react to a disaster either natural or human-induced? 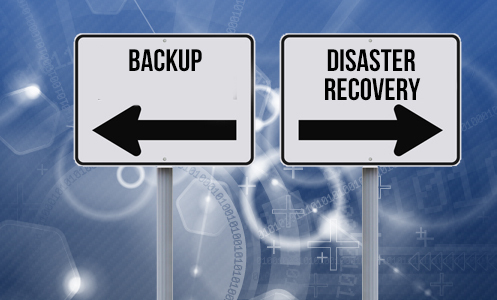 Disaster Recovery and Backup is ensuring the correct processes, policies and procedures are in place, including Backup Validation. Your business will then be prepared for recovery or continuation should there be a disaster. It’s about protecting your organisation’s data with backup and IT infrastructure to enable you to continue trading. The need for this has never been greater, let us help protect your business and your data. Backup – Ensure your data is safe, secure and protected from being deleted or destroyed whether it’s due to natural or human-induced disaster. Did you know 43% of companies never reopen following a major loss of business data? Don’t be one of them. Also known as ‘remote storage’, ensures your vital data is backed up in a separate geographical location, this could be in another office or at a datacentre. We give you the resources to do it yourself. We continuously monitor your backup system to ensure successful backups are completed as scheduled. Either by remotely monitoring your existing backup process or by taking complete control of the backup, the equipment used, and the data recovery. The process is also regularly tested to allow you to recover deleted files and ensure they are not corrupted. A perfect solution using both a NAS and the Cloud for those looking to backup data securely. It’s a low cost, low energy, space saving solution that’s much cheaper and a lot quieter than large servers and all data is stored in the UK.